If you missed Paige Parker on Ask the Cyber-Dating Expert Radio Show, she talked about her amazing book, Dating Without Drama. I’m so very pleased to add Paige’s relationship book?to the Cyber-Dating Expert Reading Room this month as our featured book. Paige has revised Dating Without Drama to include a section called “Facebook Without Drama,” with terrific insight on whether to “friend” your new beau on Facebook, ?as well as the dos and don’ts of text messaging your date. I truly believe in Paige’s wisdom about how to regain your confidence, become a man magnet, and to attract your dream guy, all in a drama free world with or without cyberdating. 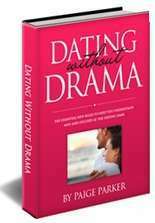 Click here to order your copy of?Dating Without Drama!